Today’s consumers are not as interested in what you’re selling, but how you can help them find exactly what they’re looking for. Many expect their relationship with their jeweler to be more than just the value of their purchase. With the busiest time of year upon us, it’s easy to overlook what might be the most important part of the sale — the customer experience. The expectation of exceptional service is even greater for luxury retailers. It’s the experience that will get customers talking about you and coming back. In an age where everyone can comment, like and share online, an outstanding customer experience defines your brand. It’s the biggest differentiator and plays a key role in making this holiday season the most successful ever. Here are three easy ways to “wow” your customers this holiday season. You’re not just selling a product; you’re selling something your customers’ loved one will treasure. Get to know the person across the counter and make a connection. To do this well, you need to make sure your staff is adequately trained. Providing outstanding customer service is the key to an enhanced customer experience. Exceptional product knowledge instills confidence and provides the value of shopping with a local independent. Beyond product knowledge, speak to them about services they may not be familiar with such as how to care for their jewelry. Include a complimentary Pearls of Wisdom brochure which explains how to care for their jewelry. Surprise your customers by going above and beyond. Instead of simply satisfying your customer, why not "WOW" them? Here are some ideas to get you started. Consider an inexpensive gift to give the customer as your holiday gift to them. Surprise them with the gift at your point of sale while the one they purchased is being wrapped. Send cookies or a special treat to your most loyal customers. During some of your busiest days and times, hire carolers to sing in your store to get everyone in the holiday mood. 3. Remember them after the sale. December is busy, but when traffic slows down a little in early January, your customers would appreciate a thank you note. Owners of other businesses that sell large-ticket items often send a hand-signed letter welcoming their customers to the “family”. In a world of everything digital, something hand-written will be noticed and appreciated. Need help getting started? Check out a few examples on thebalance.com. “It’s time to recalibrate and reset expectations as we move into the new era of retail. Retail jewelers are in an enviable position," said Mark Devereaux, Jewelers Mutual vice president of sales. “Jewelers sell emotion and something that will be treasured long after the sale." "Couple that with an exceptional customer experience, and that’s the recipe for a successful holiday season." 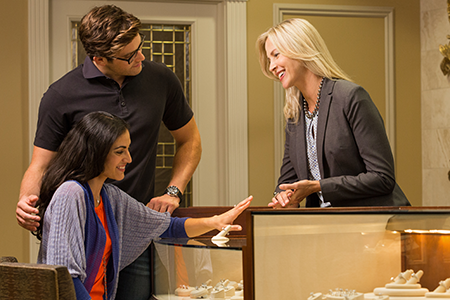 Jewelers Mutual has several premium service jeweler programs to support store owners in extending service after the sale. These programs are a great way to grow your business and enhance the overall customer experience.